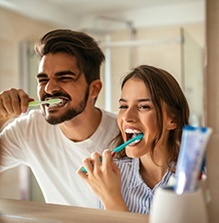 Taking care of your oral health has never been more important, especially in light of all the information we’ve learned over the years about how oral health is related to overall health and well-being. Your routine dental cleanings and checkups, or preventive care appointments help Dr. Gonzalez detect any concerns early on, monitor your oral health, and keep you on track for maintaining a healthy smile. What Happens at My Preventive Appointments? There are some very important things that take place during your routine cleaning and checkups. First is a thorough examination with Dr. Gonzalez, which allows him to detect any serious concerns such as tooth decay, periodontal (gum) disease, and oral cancer in their earliest stages. Diagnosing these issues early on give you the best chance to successfully manage these concerns with less invasive treatment procedures. 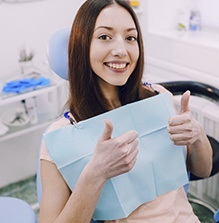 Next, you’ll meet with your hygienist to remove the excess bacteria and plaque buildup that causes issues like tooth decay, cavities, and gum disease. Your hygienist can help you make the most of your home care routine with helpful tips and advice on the right products and techniques for your needs. Studies and emerging information have helped us to understand how closely your oral health and overall health truly are related. We now understand that the same bacteria that causes gum disease can also contribute to other health concerns such as heart disease, diabetes, complications during pregnancy, high blood pressure, and stroke. Patients who have gum disease are more likely to develop other health concerns and vice versa. Visiting your dentist consistently every six months for cleanings and checkups protects both your oral health and your overall well being. If your dentist in San Antonio detects tooth decay early on, it is likely that a simple dental filling can restore your tooth to health. If you ignore your treatment needs or the decay remains undiagnosed, it will progress further into your tooth and eventually cause an infection. Now, root canal therapy is required to restore your tooth. If it’s time for your next dental visit don’t delay calling your dentist in San Antonio today. We’ll be happy to schedule a convenient time for your next appointment with Dr. Gonzalez.